Anamorphic format is the cinematography technique of shooting a widescreen picture on standard 35 mm film or other visual recording media with a non-widescreen native aspect ratio. It also refers to the projection format in which a distorted image is "stretched" by an anamorphic projection lens to recreate the original aspect ratio on the viewing screen. (It should not be confused with anamorphic widescreen, a different video encoding concept that uses similar principles but different means.) The word "anamorphic" and its derivatives stem from the Greek words meaning formed again. As a camera format, anamorphic format is losing popularity in comparison to "flat" (or "spherical") formats such as Super 35 mm film shot using spherical lenses; however, because most movie projectors use anamorphic projection format, spherical format negatives are commonly converted into anamorphic prints for projection. In the years since digital cinema cameras became commonplace, anamorphic has experienced a considerable resurgence of popularity, due in large part to the higher base ISO sensitivity of digital sensors which allows shooting at deeper stops. The development of anamorphic widescreen arose due to a desire for wider aspect ratios while maintaining the use of standard (4 perf/frame) cameras and projectors, and maximising overall image detail. The modern anamorphic format has an aspect ratio of 2.40:1, meaning the (projected) picture width is 2.40 times its height, (technically it is 2.39:1, but it is known professionally as 2.40:1 or "two-four-oh"). Academy format 35 mm film (standard non-anamorphic full frame with sound tracks in the image area) has an aspect ratio of 1.37:1, which is not as wide (or, equivalently, is taller). In non-anamorphic spherical ("flat") widescreen imaging, the picture is recorded on film so that its full width fits within the film frame, but substantial film frame area is wasted on portions that will be matted out by the time of projection, either on the print or in the projector, in order to create a widescreen image in the theater (Figure 1). To make full use of the available film, thereby increasing overall image detail, an anamorphic lens is used during photography to stretch the image vertically to fill the full (4 perf) frame. Up to the early 1960s, three major methods of anamorphosing the image were used: counter-rotated prisms (e.g., Ultra Panavision), curved mirrors in combination with the principle of Total Internal Reflection (e.g., Technirama), and cylindrical lenses (lenses curved, and hence squeezing the scene being photographed, in only one direction, as per a cylinder, e.g., the original CinemaScope system based on Henri Chrétien's design). Whatever the method used, the anamorphic lens leaves the image on film looking as if it had been stretched vertically. This deliberate geometric distortion is then reversed upon projection, resulting in a wider aspect ratio on-screen than that of the frame as recorded on film. 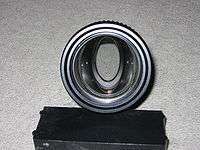 An anamorphic lens consists of a regular spherical lens, plus an anamorphic attachment (or integrated lens element) that does the anamorphosing. The anamorphic element operates at infinite focal length (so that it has little or no effect on the focus of the prime camera lens onto which it is mounted), but still nevertheless anamorphoses the optical field. When an anamorphic attachment is used, one uses a spherical lens of a different focal length than one would for 1.85:1 (one sufficient to produce an image the full height of the frame and twice the width), and then the anamorphic attachment squeezes 2x horizontally. Specialized reverse anamorphic attachments existed that were relatively rarely used on projection and camera lenses to expand the image in the vertical space (e.g., the early Technirama system mentioned above), so that (in the case of the common two-times anamorphic lens) a frame twice as high as it might have been filled the available film area. Since a larger film area needed to be used in order to record the same picture, the quality was increased. The distortion (vertical stretching) introduced in the picture must be corrected when the film is played back, so another lens is used during projection that either expands the picture back to its correct proportions or (as in the case of the now defunct Technirama system) squeezes the image vertically to restore normal geometry. It should be noted that the picture is not manipulated in any way in the dimension that is orthogonal to the one anamorphosed. Cinerama was an earlier attempt to solve the problem of high-quality widescreen imaging, but anamorphic widescreen eventually proved to be more practicable. Cinerama preceded anamorphic films, but consisted of three projected images side-by-side on the same screen: the images never blended together perfectly at the edges, and it required three projectors; a 6-perf-high frame, which required four times as much film; and three cameras (eventually just one camera with three lenses and three streaming reels of film and the attendant machinery, which presented synchronization problems). Nonetheless, the format was popular enough with audiences to spur studios to the wide screen developments of the early 1950s. A few films were distributed in Cinerama format and shown in special theaters. Anamorphic widescreen was attractive to studios because of its similar high aspect ratio (Cinerama was 2.59), without the disadvantages of Cinerama's added complexities and costs. Another characteristic of anamorphic camera lenses is that out-of-focus elements tend to be blurred more vertically. An out-of-focus point of light in the background (called bokeh) will appear as a vertical oval rather than a circle. When the camera shifts focus, there is often a noticeable effect where elements appear to stretch vertically when going out of focus. However, the commonly cited claim that anamorphic lenses produce a shallower depth of field is not entirely true. Because of the cylindrical element in the lens, anamorphic lenses take in a horizontal angle of view twice as wide as a spherical lens of the same focal length. Because of this, cinematographers will often use a 50 mm anamorphic lens when they would otherwise use a 25 mm spherical lens, a 70 mm rather than a 35 mm, and so on. A third characteristic, particularly of simple anamorphic add-on attachments to prime lenses, is "anamorphic mumps". For reasons of practical optics, the anamorphic squeeze is not uniform across the image field in any system, whether cylindrical, prismatic or mirror-based. This variation resulted in some areas of the film image appearing more stretched than others. In the case of an actor's face in the center of the screen their faces look somewhat like they had the mumps, hence the name for the phenomenon. Conversely, at the edges of the screen actors in full length view can become skinny-looking. In medium shots, if they walk across the screen from one side to the other, they increase in apparent girth. Early CinemaScope presentations in particular (using Chrétien's off-the-shelf lenses) suffered from it. The first company to produce an anti-mumps system was Panavision in the late 1950s. Panavision used a second add-on adapter lens that was linked to the focus position of the prime lens. This changed the anamorphic ratio along with focus position, which resulted in the area of interest on-screen having a normal-looking geometry. Later cylindrical lens systems used two sets of anamorphic optics to achieve the required change in aspect ratio: one more robust "squeeze" system that was coupled with a slight expansion sub-system. The expansion sub-system was counter-rotated in relation to the main squeeze system, all in mechanical interlinkage with the focus mechanism of the prime lens. This combination changed the anamorphic ratio and minimized the effect of anamorphic mumps in the area of interest in the frame. Though these techniques were regarded as a fix for the anamorphic mumps, they were a compromise. Cinematographers still needed to be careful with their framing of the scene so that effects of the change in aspect ratio were not readily apparent. An anamorphic lens can create artifacts or distortions as described above. An anamorphic lens is slower than a spherical lens, thus requiring more light and makes shooting low-light scenes more difficult. Because the anamorphic-scope camera format does not preserve any of the image above and below the scope frame, it may not transfer as well to narrower aspect ratios, such as 4:3 or 16:9 for full screen television. Film grain is less of a concern because of the availability of higher-quality film stocks and digital intermediates, although the anamorphic format will always yield higher definition than the non-anamorphic format (provided the anamorphic projection lens, which is technically more demanding, is adequate). Anamorphic scope as a printed film format, however, is well established as a standard for widescreen projection. Regardless of the camera formats used in filming, the distributed prints of a film with a 2.39:1 theatrical aspect ratio will always be in anamorphic widescreen format. This is not likely to soon change because movie theaters around the world don't need to invest in special equipment to project this format; all that is required is an anamorphic projection lens, which has long been considered standard equipment. The initial SMPTE definition for anamorphic projection with an optical sound track down the side (PH22.106-1957), issued in December 1957, standardized the projector aperture at 0.839 × 0.715 inches (21.3 × 18.2 mm) (aspect ratio 1.17:1). The aspect ratio for this aperture, after a 2x unsqueeze, is 2.3468…:1 which rounded to the commonly used value 2.35:1. A new definition was issued in October 1970 (PH22.106-1971) which specified a slightly smaller vertical dimension of 0.700 in. for the projector aperture to help make splices less noticeable to film viewers. Four-perf anamorphic prints use more of the negative's available frame area than any other modern format which leaves little room for splices; as a consequence, a bright line would flash onscreen when a splice was projected and theater projectionists had been narrowing the vertical aperture to hide these flashes even before issuance of PH22.106-1971. This new projector aperture size, 0.838 × 0.700 inches (21.3 × 17.8 mm), aspect ratio 1.1971…:1, made for an un-squeezed ratio of 2.39:1 (and commonly referred to by the rounded value 2.40:1 or 2.4:1). The most recent revision, from August 1993 (SMPTE 195-1993), slightly altered the dimensions so as to standardize a common projection aperture width (0.825-inch, or 21.0 mm) for all formats, anamorphic (2.39:1) and flat (1.85:1). The projection aperture height was also reduced by 0.01" in this modern specification to 0.825 × 0.690 inches (21.0 × 17.5 mm), aspect ratio 1.1956…:1 (and commonly rounded to 1.20:1), to retain the un-squeezed ratio of 2.39:1. The camera's aperture remained the same (2.35:1 or 2.55:1 if before 1958), only the height of the "negative assembly" splices changed and, consequently, the height of the frame changed. Anamorphic prints are still often called 'Scope' or 2.35 by projectionists, cinematographers, and others working in the field, if only by force of habit. 2.39 is in fact what they generally are referring to (unless discussing films using the process between 1958 and 1970), which is itself usually rounded up to 2.40 (with a false precision as compared to the mathematically correct 2.4). With the exception of certain specialist and archivist areas, generally 2.35, 2.39, and 2.40 mean the same to professionals, whether they themselves are even aware of the changes or not. Panavision is the most common source of anamorphic lenses, with lens series ranging from 20mm to a 2,000mm anamorphic telescope. The C-Series, which is the oldest lens series, are small and lightweight, which makes them very popular for steadicams. Some cinematographers prefer them to newer lenses because they are lower in contrast. The E-Series, of Nikon glass, are sharper than the C-Series and are better color-matched. They are also faster, but the minimum focus-distance of the shorter focal lengths is not as close. The E135mm, and especially the E180mm, are great close-up lenses with the closest minimum focus of any long Panavision anamorphic lenses. The Super (High) Speed lenses (1976), also by Nikon, are the fastest anamorphic lenses available, with T-stops between 1.4 and 1.8; there is even one T1.1 50mm, but, like all anamorphic lenses, they need to be stopped-down for good performance because they are quite softly focused when wide open. The Primo and Close-Focus Primo Series (1989) are based on the spherical Primos and are the sharpest Panavision anamorphic lenses available. They are completely color-matched, but also very heavy: about 5–7 kilograms. The G-Series (2007), Panavision's latest anamorphic lens series, performance and size comparable with E-Series, in lightweight and compact similar to C-Series. Vantage Film, designers and manufacturers of Hawk lenses. The entire Hawk lens system consists of 50 different prime lenses and 5 zoom lenses, all of them specifically developed and optically computed by Vantage Film. Hawk lenses have their anamorphic element in the middle of the lens (not up front like Panavision), which makes them more flare-resistant. This design choice also means that if they do flare, one does not get the typical horizontal flares. The C-Series, which were developed in the mid-1990s, are relatively small and lightweight. The V-Series (2001) and V-Plus Series (2006) are an improvement over the C-Series as far as sharpness, contrast, barrel-distortion and close-focus are concerned. This increased optical performance means a higher weight, however (each lens is around 4-5 kilograms). There are 14 lenses in this series which goes from 25mm to 250mm. The V-Series also have the closest minimum focus of any anamorphic lens series available and as such can rival spherical lenses. Vantage also offers a series of lightweight lenses called V-Lite. They are 8 very small anamorphic lenses (about the size of a Cooke S4 spherical lens), which are ideal for handheld and Steadicam while also giving an optical performance comparable to the V-Series and V-Plus lenses. In 2008 Vantage introduced the Hawk V-Lite 16, a set of new lenses for 16 mm anamorphic production, as well as the Hawk V-Lite 1.3x lenses, which make it possible to use nearly the entire image area of 3-perf 35mm film or the sensor area of a 16:9 digital camera and at the same time provide the popular 2.39:1 release format. Angenieux: Angenieux first zoom for 35mm film camera, the 35-140mm, was equipped with a front anamorphic attachment built by Franscope. The 40-140 anamorphic was used on several Nouvelle Vague movies such Lola (1961) or Jules and Jim (1962). Panavision adapted the Angenieux 10x zoom for anamorphic productions. The 50-500 APZA was part of the standard anamorphic production package supported by Panavision from mid 1960s to the end of the 1970s. It has been used in numerous movies including The Graduate (1967), MASH (1970), McCabe and Mrs Miller (1971), Death in Venice (1971) and Jaws (1975). In 2013 and 2014 Angenieux released a new series of high end anamorphic zooms. These lenses, the 30-72 and 56-152 Optimo A2S are compact and weighs less than 2.5 kg. Joe Dunton Camera (JDC): Manufacturer and rental house based in Britain and North Carolina, which adapts spherical lenses to anamorphic by adding a cylindrical element. Its most popular lenses are adapted Cooke S2/S3, but they have also adapted Zeiss Super Speeds and Standards, as well as Canon lenses. JDC was purchased by Panavision in 2007. However, with advancements in digital intermediate technology, the anamorphosing process can now be completed as a digital step with no degradation of image quality. Also, 3-perf and 2-perf pose minor problems for visual effects work. The area of the film in 4-perf work that is cropped out in the anamorphosing process contains nonetheless picture information which is useful for such visual effects tasks as 2D and 3D tracking. This mildly complicates certain visual effects efforts for productions using 3-perf and 2-perf, making anamorphic prints struck digitally from center cropped 4-perf Super 35 the popular choice in large budget visual effects driven productions. ↑ Why is anamorphic bokeh oval? ↑ Hart, Martin.(2000). Widescreen museum "Of Apertures and Aspect Ratios" Retrieved July 8, 2006. ↑ "Panavision to Acquire Camera Assets of Joe Dunton & Company". PR Newswire. August 15, 2007. Retrieved February 1, 2013.